One of the advantages of moving from place to place is getting to research and experience the best restaurants the South has to offer. Whenever I moved to Nashville, my list quickly took form with numerous local eateries. On the top of the list was Mas Tacos Por Favor, which is nestled in a residential area and honestly does not look like much from the outside. Mas Tacos is in the neighborhood of being a dive and super trendy (only in Nashville can somewhere be considered as both.) But, nonetheless, it stole my heart love at first bite and quickly became one of my favorite spots to eat in town. With cash in hand, I eagerly scan the chalkboard menu to make sure my favorites are available. Fried avocado tacos, watermelon agua fresca, elote and chicken tortilla soup, por favor. As soon as I find my table, my order is up, and there, sitting in front of me is some of the greatest Mexican food I’ve ever encountered. 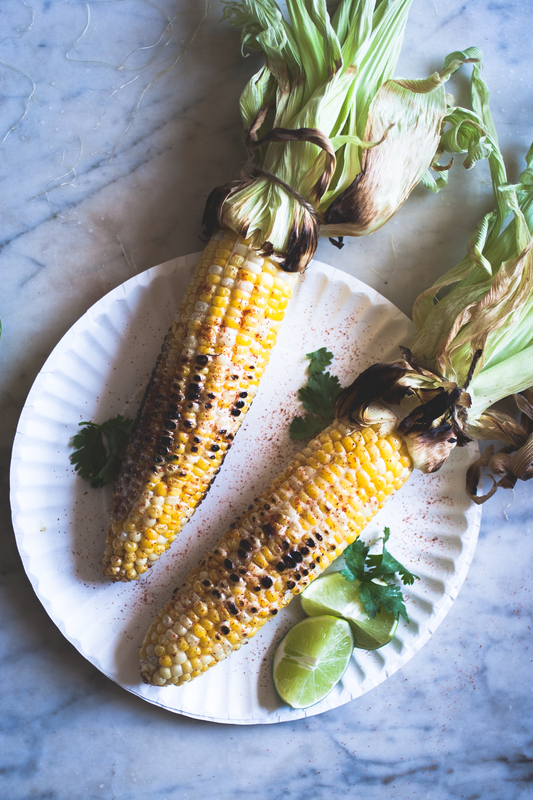 The elote (Mexican street corn) is roasted to perfection and slathered in a thin layer of mayo, kissed with shredded cheese and sprinkled with ground red pepper. 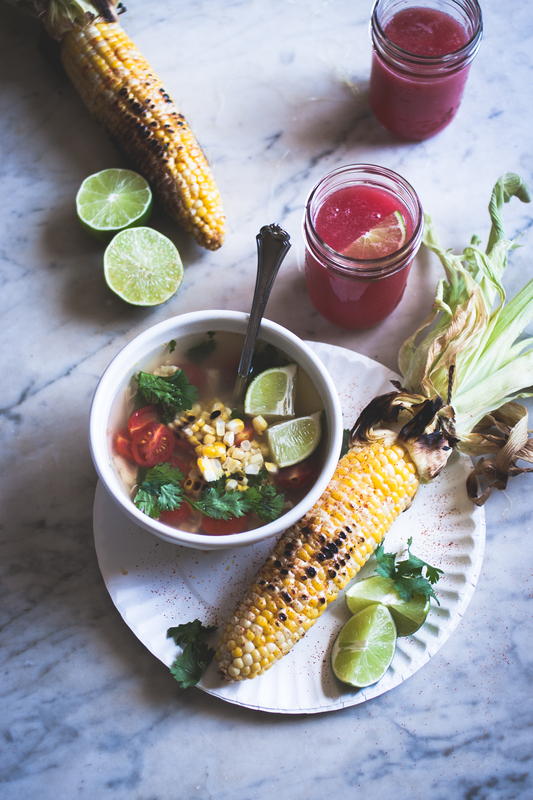 The chicken tortilla soup is so bright and acidic it becomes slightly addictive, and you MUST wash everything down with their watermelon agua fresca. This is a casual spot to meet up with friends, share stories, laugh, and most of all, enjoy a lovely meal. And you must eat there with a friend who is willing to tell you you have corn in your teeth from the elote because it WILL happen, and it’s completely worth it. It began as a simple quest to find the best in Nashville, and it transformed into a love story about wanting more out of life, well more tacos to be exact. I’ve created these recipes completely inspired by my favorite dishes at Mas Tacos so you can recreate them at home just in time for Cinco de Mayo, y’all! Note: To get the most flavor out of the cilantro stalks, gently crack the stalks with the back of a knife before tossing them into the stock. I also use kitchen twine to tie the stalks together, which makes it easier to take them out later. 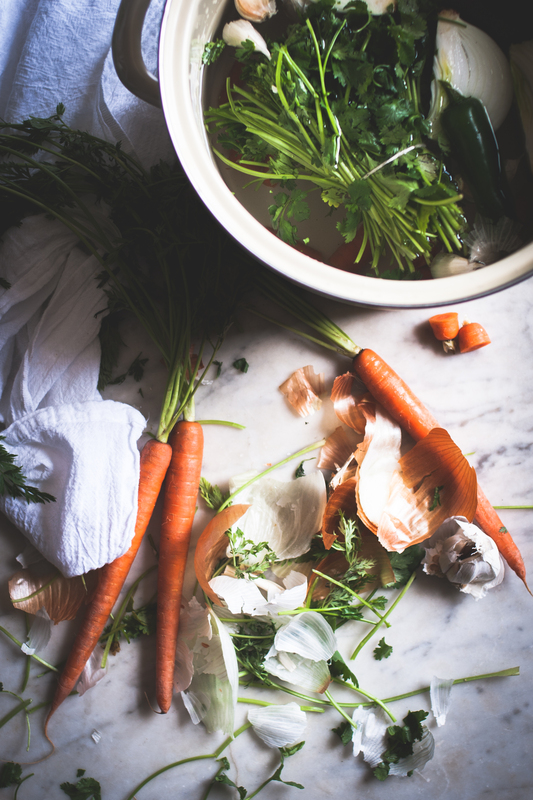 In a large stockpot on medium-high heat, combine all of the ingredients with the exception of the salt, pepper and lime juice and bring to a boil. Reduce to a medium simmer for 1-1 ½ hours. Take out the chicken breasts and shred with two forks. Strain the broth and return the shredded chicken to the pot. Add salt, pepper and lime juice. Adjust the seasonings to your taste. Garnish with avocado slices, halved grape tomatoes, cilantro leaves, roasted corn, queso fresco, rice, and lime wedges. 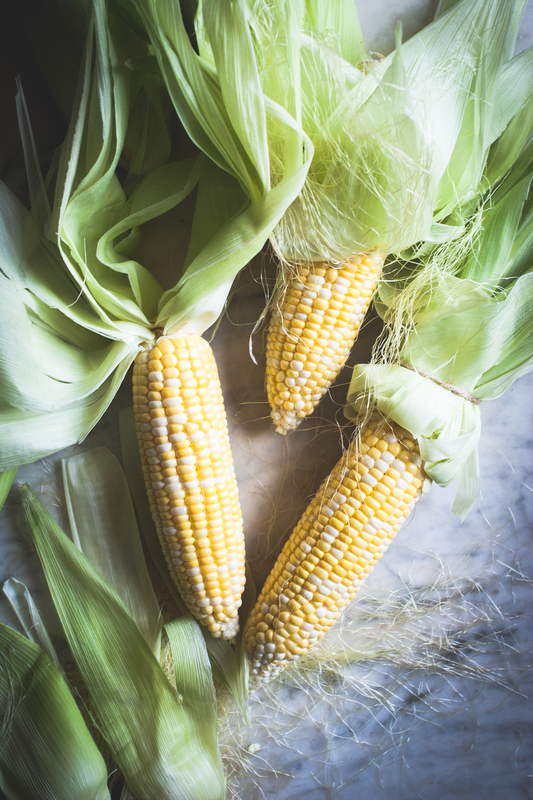 In a dry skillet over medium-high heat, roast corn until charred, turning occasionally, about 10-15 minutes. Brush with mayonnaise and sprinkle with cayenne pepper, kosher salt and lime juice. In a blender, blend watermelon until smooth. Pass through a sieve and add lime juice to taste. Serve chilled. Thanks so much! I love being able to recreate restaurant dishes as well! Since I’ve had the pleasure of experiencing the greatness of their fish tacos and fried avocados, I am completely in love with this post. Thanks for sharing this delightful soup. Isn’t their food amazing?! I love it. Thanks for the kind words! It was a pleasure sharing this lovely place and my spin on some of my favorite dishes from Mas Tacos. While reading I got the sudden urge to put my shoes on & go to that restaurant…..but wait, it´s only a few 1000 miles away! Plus your recipe adaptions sound great, and so are the photos! Oh no! I wish I could magically have everyone over and share these recipes with y’all in my kitchen for lunch, and then head over to Mas Tacos for dinner. What a dream! Thanks for the sweet words! Your post really drew me in. Just yesterday I was in a contemplatively state about Cinco de Mayo and dinner. After reading your post I know what I will be bringing to the table. Lovely. Aww.. thanks so much for the sweet words! 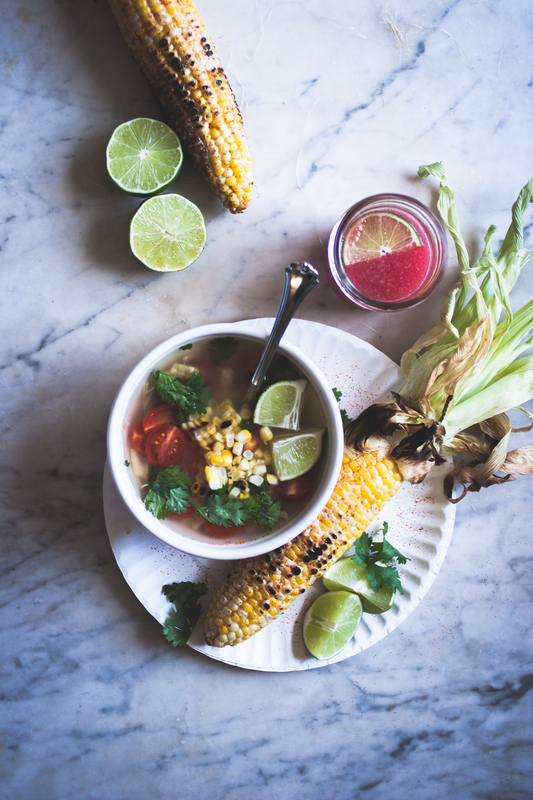 I’m glad I was able to inspire you a little for your Cinco de Mayo menu! your photos are so beautiful! corn has never looked so elegant! Thanks so much! I love how beautiful the corn looks as well! I wasn’t planning on posting a photo of the fresh corn, but it was too irresistible to pass up! Yum! a group of us are heading to Cinco de Mayo here in Australia this weekend, and you have just inspired me for our lunch before we head to the celebrations! Thank you. Yes! That’s amazing that this post inspired your Cinco de Mayo menu! Y’all have tons of fun! So rustic, simple and beautiful! We have lots of corns here. I have finally found a new corn recipe. I would definitely make it and see what it taste like.